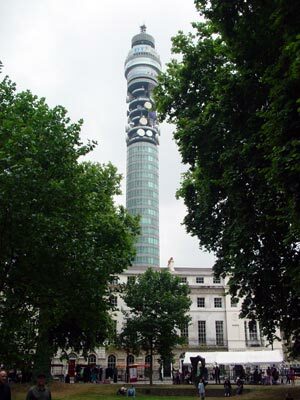 Normally, these gardens are strictly verboten to the public, but I took advantage of the Fitzrovia Square festival to grab this shot of the Telecom Tower. Opened by Harold Wilson in 1965, it is the only building in the country which is allowed to be evacuated by lift - an oddity which required Parliamentary legislation to be passed. There used to be a revolving Butlin's restaurant on the 34th floor, but the tower is sadly no longer open to the public.